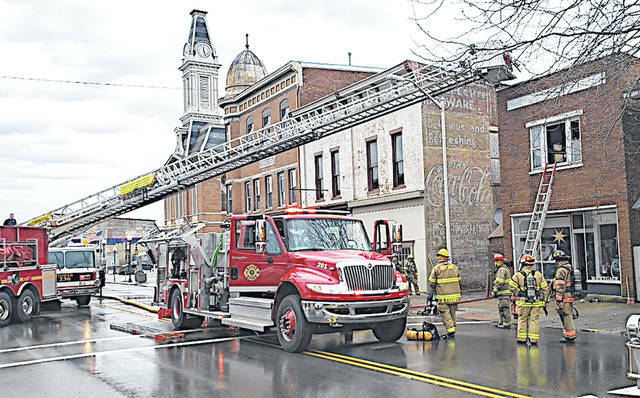 Firefighters are pictured in front of a building on Jefferson Street in Greenfield that caught on fire Saturday afternoon. Kerosene at a gas station/convenience store in New Market has been contaminated with gasoline and the Paint Creek Joint EMS/Fire District was urging anyone who purchased kerosene at the business the last few days not to use it. In a separate incident, a structure fire Saturday afternoon in Greenfield displaced a business and damaged an apartment above it. Paint Creek is currently investigating exactly how the kerosene became contaminated with gasoline and is in contact with the appropriate state agencies to mitigate the developing situation, Jackman said. The kerosene pump has been secured at the New Market store and no further kerosene will be sold until the situation has been resolved, Jackman said. He added that gasoline is four times more flammable than kerosene and will explosively support combustion. In Greenfield, Paint Creek received a call at 12:47 p.m. Saturday reporting a fire at 332 Jefferson St.
Jackman said the building housed what he believed was a mortgage business on the lower story and an apartment that was unoccupied at the time and in the process of being remodeled on the upper story. Upon arrival at the scene, Jackman said firefighters found flames shooting out of an upstairs window in the structure. He said the mortgage business was displaced due to water damage, and that the apartment received moderate damage. Paint Creek received mutual aid from the Highland County North Joint Fire and Ambulance District, Wayne Township in Fayette County, the Washington C.H. Fire Department and the Paxton Life Squad.